Do I have to put tile on the pool at the water line? No… but yes. There are some interior finishes that can be “up-and-out” of the pool water, like Pebble Tec. However, it is our recommendation that some sort of “serviceable” material be utilized at the water line so that down the road it can be cleaned or repaired should the need arise, without there being a “patched” material (like the pebble product). 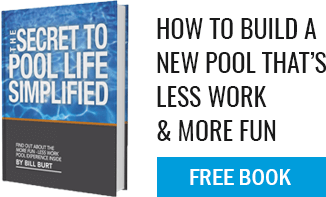 Every pool, every material, needs some servicing over the years. It is our opinion that frost resistant tile is the best way to address all the concerns associated with scum lines and service.